The funding of the export activities of Belgian SMEs is a significant part of the investment bank activities of Belgian financial institutions. Partially due to the smooth manner in which financial institutions fund companies, Belgian exports rose considerably in 2011. In the future, however, the financial sector will have to constantly pay attention to the new international rules and the extent to which they may impact export funding. 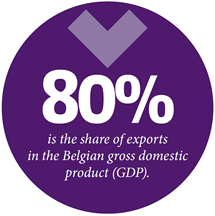 The Belgian economy is strongly dependent on exports. According to figures of the Belgian Foreign Trade Agency, a federal public service, exports from Belgium amounted to €343.4 billion in 2011.That is 10% more than in 2010, which indicates that Belgian exports barely suffered from the national debt crisis of 2011. In 2011, Belgian foreign trade even showed better results than before the bank crisis of 2008. That is certainly partially due to the fact that financial institutions also continued to smoothly carry out company funding during the crisis. Since the crisis of 2008, the volume of outstanding corporate loans has risen by 19.8% from €97.1 to €116.2 billion. The funding of the export activities of Belgian SMEs is therefore also a significant part of the investment bank activities of Belgian financial institutions. In Belgium, investment banking has little to do with the so-called speculation that is so heavily criticised. Belgian investment banks look to collect money for large projects, bring companies to the stock exchange or advise companies about how they can receive optimal loans. The funding of export activities is, of course, also part of that. The so-called speculative activities that form an important part of the activity of American investment banking rarely still occur in Belgium. But even the traditional investment banking of the Belgian banks risks coming under pressure. In the framework of the transposition of Basel III, the European Commission proposes that banks must reserve more capital for their trade funding. This higher risk coverage will probably make export loans more expensive. During the Ecofin meeting of 2 May 2012, Finance Minister Steven Vanackere was willing to admit that a more flexible risk weighting for export loans may be determined. That way, internationally oriented companies would continue to enjoy affordable export funding. Together with Finance Minister Steven Vanackere and Flemish Prime Minister Kris Peeters, the sector develops many initiatives to guarantee that. The Business Financing Platform, the dialogue platform of the financial sector that aims to reinforce the confidence of entrepreneurs in the sector, also works according to the principle that export funding is required to maintain our level of prosperity. The Platform considers therefore how the funding of exports can be facilitated and which legislation may pose a threat. With the new international banking rules, this is definitely an important issue.